Throughout history, people have been suspected of evildoing when they experience either excessive misfortune or astoundingly unfounded success. Persistent misfortune was seen as a form of (deserved) divine punishment, and incredible luck was considered a sign of diabolic aid. 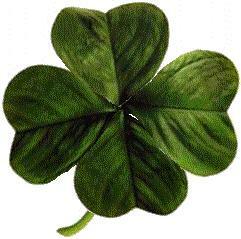 For some, the four-leaf clover was just a drinking man's pentagram. Based on this understanding of evil doers, the Ottawa Senators are clearly guilty of devil worship. They have lost franchise stars (including Erik Karlsson, Jason Spezza, and Craig Anderson) to terrible bad luck, and yet they continue to win games and maintain a playoff spot. In previous centuries, the Ottawa Senators would have found themselves chased out of Kanata by a mob brandishing pitchforks and torches. If I hadn’t moved out of town, I’d probably join them in banishing this team of obvious heretics. Nothing short of 24/7 rink surveillance will convince me that the Sens haven’t been using their faceoff zones at Scotiabank Place as necromantic summoning circles. 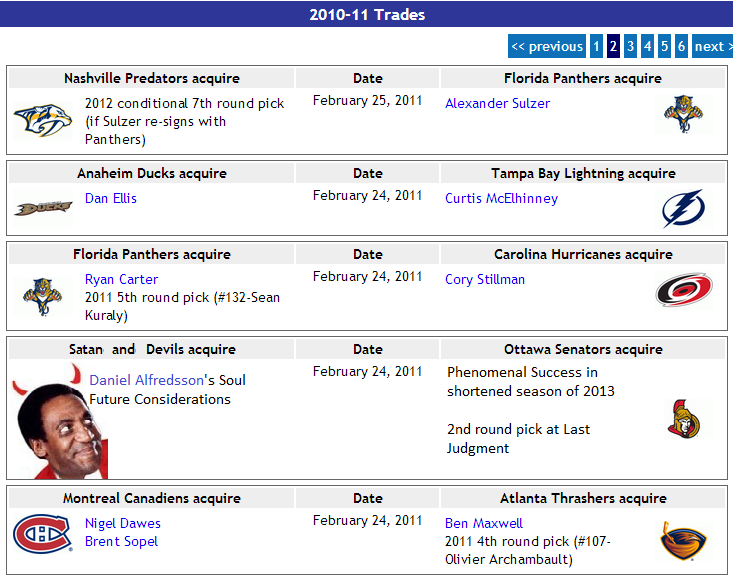 I imagine that the Sens’ decision to partner with the underworld happened as follows. Following the Sens’ loss to the Penguins in the 2009-10 playoffs, Eugene Melnyk (like Satan from John Milton’s Paradise Lost) woke up in a lake of fire (in Melnyk’s case, his hot tub in Barbados) and assembled his diabolical council to discuss how to strike back at those who felled them with righteous fury. After trading away Mike Fisher, Chris Kelly, and others who refused to take part in their unholy pact (in a similar manner as Milton’s Satan expelled godly angels from his cohort prior to the war in heaven), the Sens completed an under-the-radar trade just before deadline day in 2011. There’s no longer any evidence of the transaction available online, so I posted a screen capture. The proof of this devilish deal also appears on Daniel Alfredsson's face, which has grown increasingly frenzied since this deal took place. Perhaps there's another reason for Ottawa's baffling success. I may end up having to admit (grudgingly) that Paul MacLean is (in the secular sense) one hell of a coach. But if a legion of devils show up to skate with the Stanley Cup this season as part of the Senators' managerial staff, just remember that I told you so.